Prestashop eBay integration addon is a smart solution to synchronize your Prestashop store with the eBay marketplace. The Prestashop eBay integrator provides real-time synchronization between the two platforms. The in-depth integration between eBay and Prestashop established byPrestashop eBay integration plugin makes it easier for the store admin to manage the inventory and process the orders from a single platform. Making it easier for the Prestashop store owner to sell their product on the popular marketplace, the eBay Prestashop integrator can effortlessly boost the revenue of the site. Along with easy inventory management, the Prestashop eBay integrator even offers an effortless means to manage the orders of the marketplace from a single interface. The cron options offered byPrestashop eBay integrator allows the admin to keep the two store in sync with each other. Listing the products and selling them on ebay.com is the easiest way to go for multi-channel selling. The Prestashop eBay integrator facilitates this for the store owners by offering them a means to add international and domestic shipping options. The eBay Prestashop integrator can effortlessly expand the reach of the merchants and help them tap a larger audience base. The e-merchants can now take their business on the international platform with the help of Prestashop eBay connector. The Prestashop eBay Integration module allows the admin to connect to the various eBay sites in just a few simple steps. The real-time synchronization offered by Prestashop eBay integration plugin makes it easier for the admin to list the products and update the related details on the marketplace from their respective Prestashop store. The admin gets an option to include multiple domestic and international shipping options in the back-end of the Prestashop eBay Integration extension. The orders can be imported from ebay.com to the Prestashop store and the change in their status can be updated back to the marketplace by executing cron in the admin interface of the Prestashop eBay Integration addon. The automated approach of the eBay Prestashop API integrator allows the store admin to integrate their site with the marketplace and cater a larger audience base with least effort. The multi-lingual and multi-currency support of the Prestashop eBay Integration plugin allows the store admin to sell their products across the border. Prestashop eBay synchronization addon makes the online transaction flawless both for the sellers as well as the marketplace buyers. The merchants can manage the shipment as per their desire and requirement from the back-end of the Prestashop eBay Integration module. 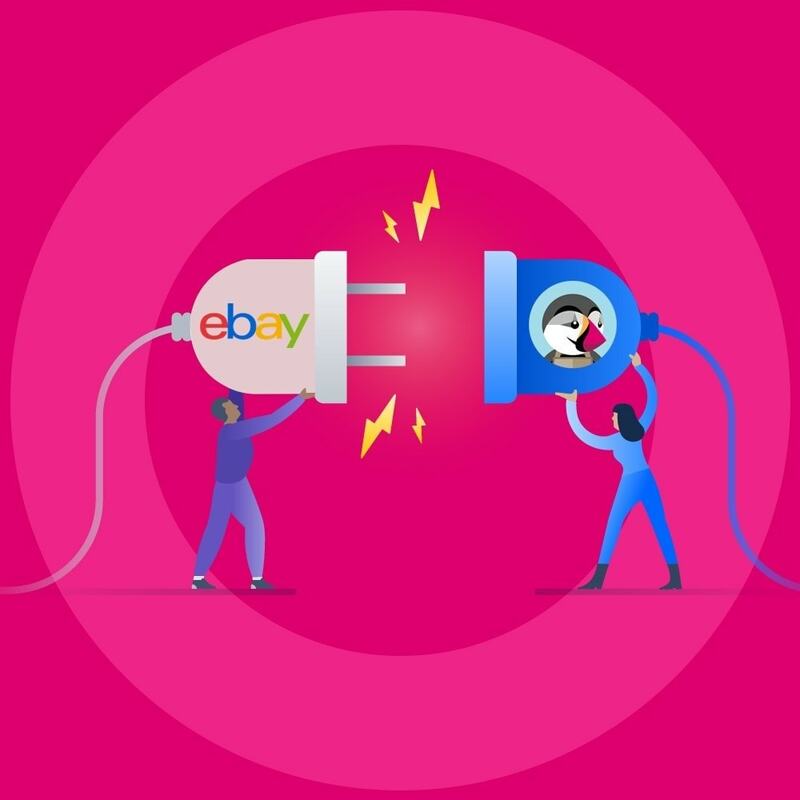 Multiple Site Integration: The Prestashop eBay API integrator makes it easier for the store admin to connect to the different eBay sites operating in the different countries. The admin can select the language and currency of the respective country. The eBay Prestashop integration addon is multi-lingual compatible. Inventory Management: The profile-based product upload offered by eBay Prestashop integration module allows bulk inventory upload. No manual synchronization is required. The related details, that is, the product information, images, and pricing etc. is updated from the back-end of the eBayPrestashop integration plugin and synced with the marketplace with the help of cron job. 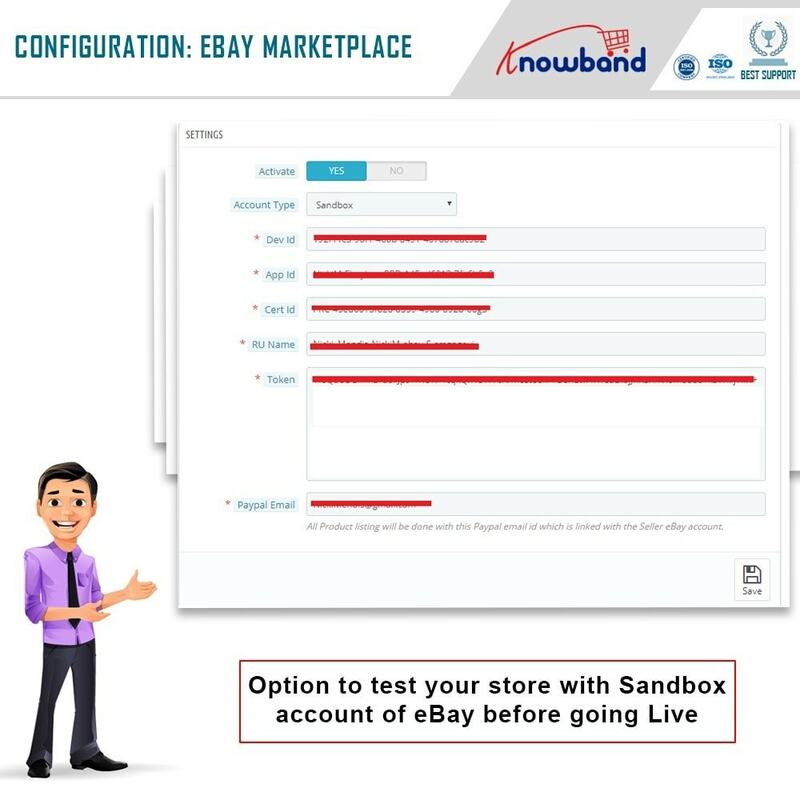 Any change in the product quantity is updated in the marketplace from the store itself with the help of the eBay Prestashop integration extension. Category and Attribute Mapping: The eBay Prestashop API integrator offers an effortless means to map the Prestashop categories with the category of eBay. 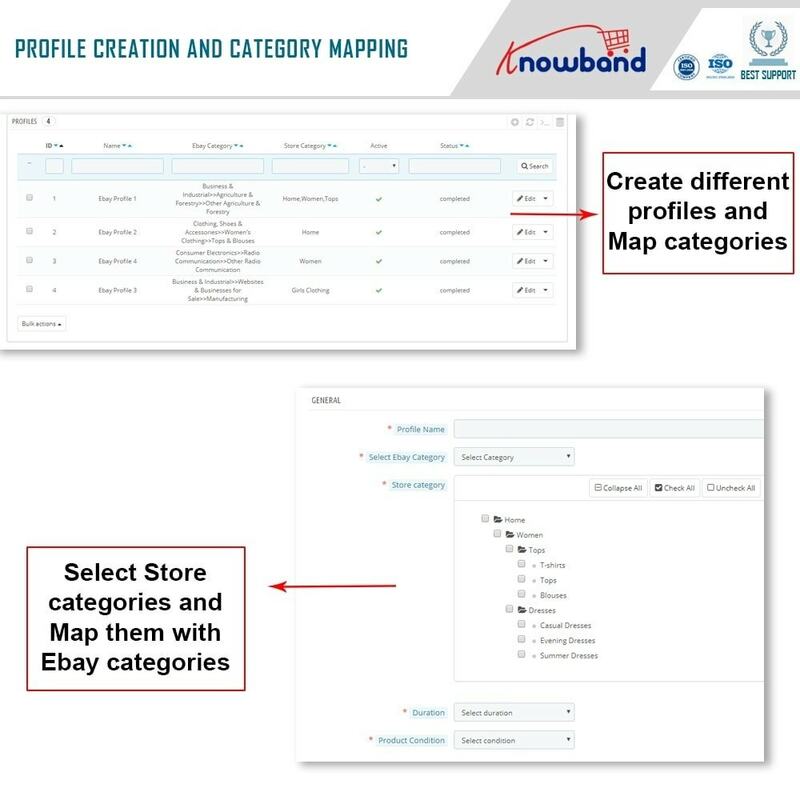 This makes it easier for the admin to map the products in the relevant category of ebay.com.eBay Prestashop synchronization addon even allows the admin to map the product attributes of the store with that of the marketplace. Shipping Management: The store admin can add multiple shipping methods for the marketplace customersviaeBay Prestashop integrator. The eBay Prestashop integration addon offers a means to set the priority of the shipping methods. 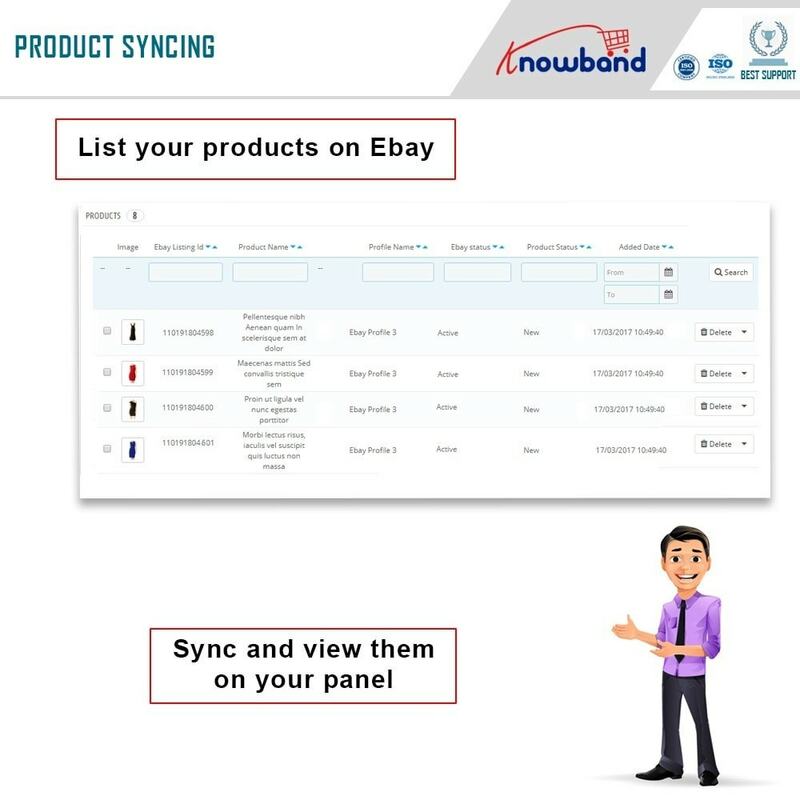 The shipping options will be displayed in the front-end as per the priority fixed in the back-end of eBay Prestashop connector. 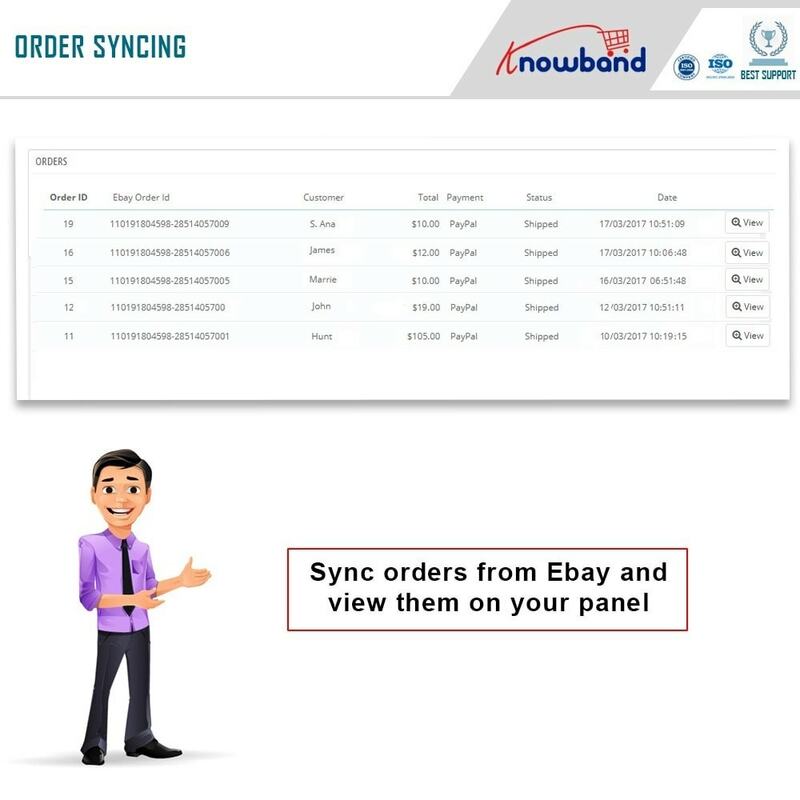 Order Movement: The admin can move the orders received from the eBay marketplace to their site with the help of this Prestashop eBay integration module. This makes it easier for the merchants to track and manage the orders from a single platform. The store admin can even fix the order statuses and sync them with the marketplace with the cron options offered by an eBay Prestashop integrator. Error Handling: The errors occurred while listing the products in the marketplace can be viewed from the back-end of the eBay Prestashop connector. Audit Log: The audit log allows the store admin to keep track of the various tasks that are being performed in the back-end of the eBayPrestashop integration extension. The Prestashop eBay integration module can be done easily as the module is easy-to-understand and use. The synchronization is done with the help of cron jobs offered by eBay Prestashop integration extension. The Prestashop eBay Integration module offers multi-currency and multi-lingual support. The versatile interface of the Prestashop eBay Integration module is compatible with all the themes and works on the latest Prestashop version. Prestashop eBay Integration addon is SSL compatible. The eBay Prestashop integrator comes with a free support of three months. Customers can shop from a wider range of products and find the product of their choice. 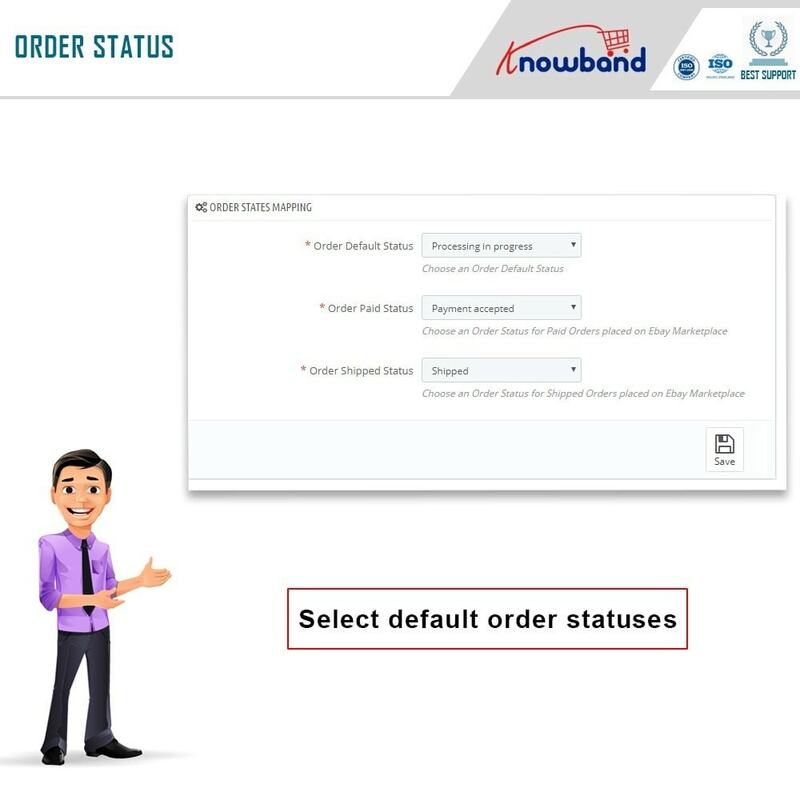 Multiple domestic and international shipping options make it easier for the customers to get their product via feasible carrier options.